This trip actually happened on 6 November 2010, and was previously documented at my website, but I have since decided that rather than loose all of these train trip posts I would reproduce them here. The train was operated by Reefsteamers. This trip took place on 6 November 2010 from Germiston to Magaliesburg. This was the first outing of the GMAM – 4079 “Lyndie Lou” since she was re-certified. Unlike previous trips that started at Maraisburg, this time around the trip started out at Park (Johannesburg) Station before heading to Magaliesburg where passengers would be disembarked, before continuing west until we reached “Swallows Inn” where the train would unload the balance, before continuing to Vlakdrift where the loco would be serviced. Fresh out of the shed and almost ready to go. I boarded at the Reefsteamers Depot in Germiston so almost had the train to myself as we headed towards Park Station. It was the first time I had been through Germiston and Johannesburg stations since 1986. We also went past the apprentice school where I trained all those years ago, and through Braamfontein, Mayfair and Langlaagte, all my old stomping grounds. How long ago was it that an SAR liveried train had stopped at this station? and how many memories were made at these main line platforms? Braamfontein used to be a busy place, and I was trained at the apprentice school behind the station. There used to be a spur that turned right here and crossed into Milpark. That was where they made up the main line trains, and it was also used in January and July as the place where National Servicemen would start their two years military service from. The weather was variable during the whole trip, starting out as grey and muggy, turning to sun and then rain and then sun which explains some of odd colours. Mayfair Station was my link to the SAR network, and you could actually see the back of our house from a passing train. It was a busy commuter station, and I travelled in both directions from here. I last used the station in 1984. There was a lot of talk of widening the tracks in and out of the station and a lot of houses were expropriated, but the expected construction never happened. Then we were passing through Krugersdorp, then passing Millsite and shortly after that the disgrace called Sanrasm, and then the long haul to Magalies, with its attendant curves and whistle blowing. There were reportedly 600 people on board and it was a 16 coach consist, and probably one of the strangest trains to be seen by those who saw us go past. Steam engines still draw stares from those that have never seen them, or by those who remember them. 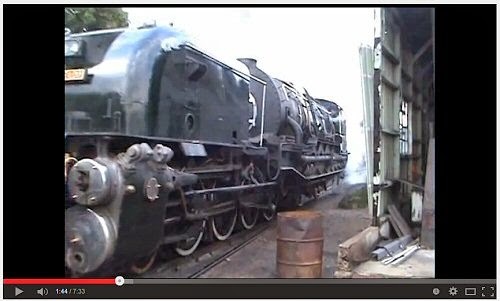 Our Garratt was a rare beastie, and it was always difficult to know which way was the front. One of my colleagues from work was at Magaliesburg Station to capture the train as it entered the station. The slog up the hill before the station is a good place to experience the loco working hard. Although I don’t think 4079 really struggled all that much. Special thanks to Clinton Hattingh for these images. Then we were through the station and heading towards Swallows Inn. Here we disembarked, and the train headed on a bit further down the line for servicing and turning around. I drifted around Swallows Inn, the service was poor, and I seem to think I spent most of my time waiting for my lunch to arrive. Next time I would just stay on the train and go do some photography instead. Then it was time to go and our train was ready to embark on the return trip, and this time we were water tank first. The train is usually much quieter on the return trips. Too much alcohol has deadened the senses, children are worn out, and families sit huddled together. And of course the afternoon still stretched ahead. A lot can go wrong between here and Park Station, as has happened before. I enjoyed hanging out of the window and watching the loco in front, steamers are very alive, their noises change depending on how hard they work, and there are many tough grades in that area. But it was a reasonably uneventful trip home so far, and when we looked again we were in Krugersdorp. And its beautiful old station building. The scenery had changed now, from grass and veld to buildings, roads and cars. The sun was also leaving us, so photograhy was becoming more difficult, although there are some who love this low down sunset light. And looking back towards the Nelson Mandela Bridge in Braamfontein. And then we were at Park Station, and passengers were disembarking and I had the train to myself once more. We wound our way past Ellis Park, Jeppe, George Goch, Denver, President and finally through Germiston Station before we came to the depot in Germiston yard. The lights were on, so somebody must be there. It is not a straight forward job to get into the depot, a lot of points have to be crossed and direction reverses made until the gate is reached. I climbed off the train and headed to my car. I had to drive back the way we had just come, while the Reefsteamers members had to shunt the train, tidy up and put the loco to bed before they could make their weary ways home. It was a long day, but it was also a glimpse into an era passed by. I was also shooting video on that trip and these can be found on Youtube. I seem to recall there are 4 in total. Special thanks to Les of Reefsteamers who found me a spot on the train, as well as Clinton Hattingh for the pics, and of course to the Reefsteamers crew who did such a great job. I had always had a hunkering to go on a Friends of the Rail trip, but never seemed to do it, until one day Reefsteamers was offered seats on the 150th Celebration of Steam Railways in South Africa trip to Cullinan. This trip took place on 26 September 2010 from Hermanstad to Cullinan, and I was really looking forward to seeing their train as it had magnificent vintage slam door suburban coaches. I had always wanted to ride in one of them and this was my chance. The loco up front was 19D-2650 “Cheugnette”. We were blessed with great weather were soon ready to go. Friends of the Rail (aka FotR) operates out of Hermanstad in Pretoria, and they have a very nice collection of rolling stock and loco’s at their disposal. Unfortunately though, Pretoria is a bit out of my range, and I had only visited their site once before (and nobody had been home). And then we were off. I do not know the route that the train takes, although I do recall we went past Capital Park and Hercules, although where they fit into it is beyond me. I had also never ridden behind a 19D and she was really romping up front, she had a wonderful whistle too and the coaches were a pleasure to travel in. At some point we stopped. The line is a busy commuter line too, and naturally precedence is given to Metrorail. We were passed by a 10M5 here, and it was interesting to see the difference between two the generations of suburban traction. From here we had a clean run to Reyton where we collected the Staff which gave us permission to use that line. A few years ago a 15F operated by FotR derailed on the way to Cullinan after sleeper theft, but we were fortunate that all sleepers were intact as we wound our way into the sleepy mining town. Once we were alongside a short ceremony was held to celebrate the 150th Celebration of Steam Railways in South Africa. It also gave me an opportunity to have a look at the whole train without a platform in the way. Unfortunately the light post I could do nothing about. And there were photo opportunities with Cheugnette. At this point I headed off to the local cemetery and to do some sight seeing. The town isn’t really very big, and one of the major attractions is a large hole (and you cannot even see that properly). There is also a very strong military heritage to the town, but I did not have the time to explore it. I soon ran out of things to see so headed back to the station where our loco was being serviced and having a drink of water. Once that was completed she was turned around and then ran back down the line to be at the front of the train in readiness for our return. A few last minute photo opportunities were provided and then we were ready to leave. There were quite a few linesiders on the way back and I bet they got better pics than I did, the curvature of the track did not give me enough of a view of the loco ahead, so opportunities were few and far between. And of course as we got closer to Pretoria we started to encounter many of the Gautrain works that were extending to Hatfield. The Gautrain was still a few months away from being in operation, and I believe that some great images have been taken on this stretch of track of the Gautrain since it opened. And there are still remnants to be seen of the old South African Railways along this route, even if they are long disused watertanks and SAR liveried coaches. The end destination was in sight, all that was left was to shunt into the Hermanstad and disembark. It was over. Time to head off home. I had a long drive back to Johannesburg, and it was getting dark quickly. Hopefully my GPS would not get me lost like it did last time I was here. Well done Friends of the Rail for great trip, and long may you go on preserving this heritage.